You’ve heard a number of times that we need to live in the now… live for the future… let go of the past… and many other idioms that speak of the ages of yesteryear being long behind us and holding us back from becoming who we might potentially be. The thing is… following that advice doesn’t seem to be making a clear and positive change in the present world, either! How are we to know that all this “present-living” is really having any impact at all if nothing seems to be changing!? That’s why it’s crucial to ignore every one of those mantras and, instead, dive right back into the past where things made a heck of a lot more sense and the fashion ensured that we’d plant ourselves firmly into memory and last well into the future. That’s the real path to immortality, no doubt! People want to say, “Disco is dead!” but, if that were the truth, people wouldn’t need to keep trying to convince everyone of it, now would they!? Would they!? Ha! 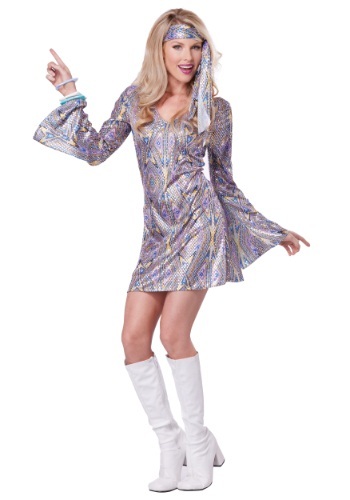 You can be the last lady laughing, too, and prove that disco is not only the lessons of the past but also remains as the style of the future with this Women’s Disco Sensation Dress. Made of comfortable polyester—what else for the 70s!—this dress has a sweetheart top and is perfectly form fitting. The outrageous pattern of color on the outside of the dress is psychedelic and made even better with the glinting of silver sequins. Finish off the look with the matching headband and you’ll be transported right back into the grooviest of decades and ready to boogie oogie oogie all night. This dress was perfect for a 70's themed Halloween party. I got lots of compliments!! I normally wear a size medium. I ordered a large and glad I did. It was a perfect fit. Runs small. I am normally medium but should have ordered this in large. Also beware it is very short (I am 5'6'').